I recently was reading though some of my favorite blogs and came across an interesting recipe from theKitchn. The editors there were working their way through a cookbook called The New Portuguese Table by David Leite which featured a recipe for a delicious Milk Vodka Liqueur. The documented process both intrigued and fascinated me. As someone who enjoys making her own vodka infusions as well as her own vanilla extract (vanilla bean & vodka)- it appealed to me as something I immediately wanted to try. The recipe is simple, equal parts whole milk, sugar, vodka plus flavor additions (orange, chocolate, lemon, lime etc.) and the process looks disgusting to put it bluntly. You have to let the whole mix sit, coagulating for ten days in a dark, cool place. The result is an astonishing beautiful, clear liqueur that is lemony, milky, with a syrupy feeling in the mouth and all-around amazing. The finished product is perfect sipped straight, and is amazing, I’m sure, mixed with similar liquors. It’s almost like a creamy limocello, but sweeter, not as furniture polish-like. You can make this in small batches or larger batches, always keeping the portions equal. I started with a few variations- lemon first and then chocolate (85% cocoa) & orange. I struggled a bit through the filtering process but found the best option eventually, which I will share with you. Also, do yourself a favor and get over to Michael’s to pick up some cheap mason jars, which they have in different sizes that are perfect for gifting. Make sure your jars are absolutely clean before beginning this process. I put mine through the dishwasher first. ½ of a lemon, rind and all! Add all liquid ingredients into your jar first, then add the lemon last wedging it in. Close your jar tightly and shake vigorously to allow the sugar to dissolve. Leave your jar in a cool, dark place for ten days, giving it a shake every couple of days or so. After your ten days of infusion, it’s time to strain your liqueur. I found the best option for this is to take a coffee filter & stick it into another vessel forming a pouch and securing the sides with tape. The tape ensures that your milk solids won’t mix with your finished result. Pour a little through your strainer, giving it a bit of help with butter knife or spoon when it seems to slow down a little. Change the filter if the solids seem to be REALLY clogging up. You can strain it 2x if necessary- take cues from the liquor, if it looks cloudy, strain it again. The finished result can be stored for months. We love this after dinner, almost like a dessert liqueur. I tried two variations of this recipe, but the possibilities seem endless. I’m thinking some raspberries or strawberries would be lovely, as would some chai tea infusions. Always remember that with cooking and anything else, garbage in equals garbage out, so always use quality raw ingredients, like a premium vodka or Lindt 85% cocoa to ensure your result will be great. Don’t be afraid to drink the finished result. I know the process seems odd, but the result is delicious. My parents loved it and so did everyone else I forced to try it. Since I’m on the Spanish tip right now, I figure why not continue with breakfast foods that are my favorite, that I’ve eaten for years that I think you might like as well! Chorizo con huevos, is one of those favorites. It’s a traditional Spanish breakfast dish that is typically made and served in a small (9.5 inch) clay cazuela dish that is handmade and glazed, that you are supposed to soak in water for a few hours prior to first use. You can get them here. My mother, knowing that it is one of my favorite meals, brought me two cazuela dishes from Spain and gifted me with them when I first moved out of my house. Ever since she taught me how to make chorizo con huevos, it has continued to be a favorite of mine. It is easy to make, satisfying and also helpful for a hangover. The chorizo that I use for this dish is typically the dry cured kind that Goya makes. They come vacuum sealed in packages of two or four. Back in the day, my parents decided to make their own chorizo. I would go downstairs in the basement and there would be hanging chorizo everywhere, dry curing. You can imagine what it smelled like down there- a combination of saffron and dried meat- which wasn’t the most savory. Thankfully, they’ve retired their at-home chorizo making. If you happen to have some marinara or jarred spaghetti sauce in your house, this works just fine. This dish is pretty low maintenance, so just use what you have! The below uses the most basic tomato sauce as a base, which if this is what I’m using, I like to add some spices to for a better flavor. Put your cazuela dish onto your burner and turn the heat on to medium. You don’t need oil here because the chorizo will release a lot of oil when you cook it. Add the chorizo and sear it on both sides. I happen to like my chorizo with a little bit of crunch, but you can cook it however you see fit. Crack your egg directly into the middle of the cazuela dish and then turn your heat to low. The reason why you do this, is because it WILL splash as you cook it. As the egg continues to cook, spoon your desired amount of tomato sauce around the egg. For me, it’s about 4oz of tomato sauce. Sprinkle with the garlic powder, the oregano, salt & pepper. Turn the heat off and allow your egg to continue to cook up. Now, I happen to like my egg cooked on the well side, so I take my cazuela dish and pop it in the microwave for 45 seconds to really set the egg. If you take this step, be sure to tent the dish with a paper towel, so you don’t make a mess in your microwave, also pierce the egg with your fork prior so that it doesn’t explode in there! Serve with toast and enjoy a traditional Spanish breakfast! I’m sure you’ve heard of churros and I’m sure the majority of you have eaten churros. One memory I have of churros comes from when I was little and my mom would drag me along to Kmart. At the sad snack counter they had one of those standing heat lamp devices that rotated and had churros hanging from little hooks. They always looked like they were coated in sugar and were all uniform in length and size. When I would ask my mom if I could get one (they were usually like 3 for a $1) she always said “no” and that they “weren’t good”. My mom had a bias when it came to churros and for good reason. My OTHER memory of churros comes from having spent many summers in Spain for many years growing up. 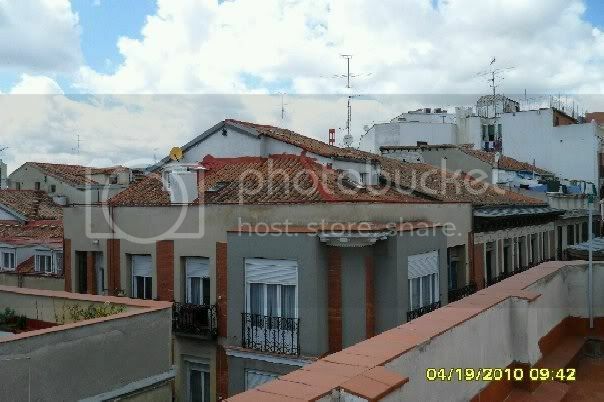 We would often visit my family in Madrid for 3-4 weeks in August every year. Throughout Madrid in all the bakeries and in all the tapas bars in the morning you could purchase freshly made churros. 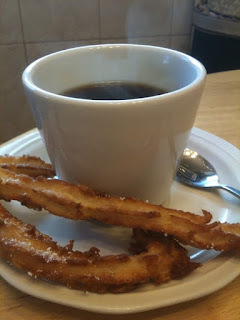 I was obsessed with these churros and EVERY morning would ask my grandmother for “churros con café”, yes as a child I wanted coffee. I was drinking coffee at about 7 but I digress. So every morning my family would go purchase a ton of churros, they would come in a brown paper bag and I would eat them with my café out on the terrace of my grandmother’s apartment. They weren’t the churros that were covered in cinnamon and sugar and they weren’t even stick shaped. These came in uniform loop shapes without any kind of sugary addition or flavoring, yet they were utterly light and delicious. I rarely have the opportunity to have these Spanish style churros anymore, so to my surprise when I visited my mom a few weekends ago and she asked “do you want to make churros?” of course I said YES. My mom happens to have a churrero, which is a device similar to a pastry or icing tube where you spoon the mixture into a tube and crank down on the opposite end to push the mixture through a star shaped tip. My mother claims that it’s a long standing tradition to use a device that has no metal, so hers is made of plastic. You can find one here. My mother says it’s crucial to use a wooden spoon to cut the piped pieces into the oil. Despite my researching why this is the case, I’ve haven’t found anything substantial that lends to this school of thought, but I will take her word for it and continue the tradition. I’m sure you can use a pastry bag with a plain piping nozzle as well! You have to see the efficiency of the way churros are made locally- the loops are so perfect and uniform. I have no such skill, so my churros turned out slightly more “rustic” if you will. Sift the flour, salt and sugar in a bowl. Put the water and oil into a pan and bring to a boil. Slowly add the flour mixture into the boiling water/oil and mix with a wooden spoon until it forms a thick paste. Turn off the heat and allow the mixture to cool for 5-10 minutes. After the mixture has cooled, add the egg and mix until smooth. Spoon the dough mixture into your pastry bag (use a ½ plain piping nozzle) or churrero and pipe it directly into your heated oil (which should be about 300 degrees) making loops or “s” shapes. This takes practice- you can do as I do and just go with the generic shape flow, using a knife or wooden spoon to cut the dough to your desired length. Fry for about 2 minutes or until golden brown. Drain the churros on paper towels and give a light dusting of confectioners sugar or cinnamon while still hot. Serve immediately…hopefully with café or chocolate! Have you ever had a fish taco? Yeah, yeah let’s try to ignore the obvious joke insertion here. I wanted to make those jokes too prior to having one. Here in New York there is actually a shortage of really good, fresh baja style tacos in general. The kind of Mexican tacos you typically find here come in a crunchy corn shell and have some kind of super dressed meat or chicken, heavy on the cheese and sour cream. Here in New York, fish tacos are a rare occurence. So what IS Baja Style? Baja style is characterized by fresh, healthy, light ingredients with a heavy emphasis on fish, fresh salsas and salad- it’s kind of a mix of California style meets Mexico. I for one really enjoy Baja style Mexican food because it doesn’t weigh in your stomach like you ate a lead, cheese covered brick. SO, as of right now, the LAST time I ate an excellent fish taco was last spring, right around April or May when I was down in South Carolina for my friend’s wedding. Part of our celebrations included a mandatory trip to Taco Boy a great Baja style Mexican restaurant right near Foley Beach- it’s so quintessentially beach bum, one of those places you can go to in your flip flops with sand still in-between your toes. The fish taco they had there was damn near perfect. The fish so lightly battered placed on just the right amount of shredded cabbage, a few slices of radish, a wedge of lime and a light, lovely ancho chili yogurt dressing all for a mere $3.95 each! I ate about four of them, washing it all down with a margarita on the rocks. This taco was the type of food that you think about for months after you eat it. So, from the second after I ate one, my quest to recreate the experience commenced. Since I knew that finding a comparable fish taco in New York was not going to happen, my only option WAS to recreate. The below comes as close as I can get and it’s pretty damn close. I like to use cod because it holds up well to frying. I also pair this and ANY Mexican food I make with fresh pico de gallo. Go get yourself some Coronas and enjoy! In a medium bowl, mix together yogurt and mayonnaise. Gradually stir in fresh lime juice until consistency is slightly runny. Season with jalapeno, capers, oregano, cumin, dill, and cayenne. Heat oil in deep-fryer to 375 degrees. Dust fish pieces lightly with flour. Dip into beer batter, and fry until crisp and golden brown. Drain on paper towels. Warm your tortillas. I like to do this by placing the in-between paper towels and microwave them for up to 1 minute. To serve, place fried fish in a tortilla, and top with shredded cabbage, pico de gallo and white sauce. In a medium bowl, combine tomato, onion, lime juice, garlic, jalapeno pepper, cilantro and green onion. Season with salt and pepper. Stir until evenly distributed. Refrigerate for 30 minutes. Those that know me know that music has always been a big part of my life. I love live music, I used to love performing music and since my iBook operates as more of a portable cookbook, I love combining good eats with good beats. For a while I was on a bossanova kick and had a lovely sauté soundtrack the likes of Sergio Mendez, Getz or Gilberto. Sometimes I cook with Kanye or whatever I might be in the mood for. It really is no secret that culinary enthusiasts and music enthusiasts tend to have overlapping hobbies and interests. The music/culinary connection goes even further when some of our favorite musicians enter the game by producing and selling food & drink items. Alcohol seems to be the product of choice for many hip-hop and rock stars, for obvious reasons. I suppose the exposure to every available top shelf alcohol allows them to develop a palate for what they believe tastes best and what they can produce to fill whatever category void they feel existed. OR they are all just raging alcoholics and have little else to do with themselves than slap their name on a top shelf liquor to make more money. Okay, okay, let’s just suspend disbelief and pretend that these guys are genuinely passionate about the food and drink items they slap their names on. The slogan for Sammy Hagar’s Cabo Wabo Tequila is “You Don’t Have to be a Rock Legend to Enjoy Cabo Wabo Tequila”. I’m assuming this is his capitalizing on recently being inducted into the Rock & Roll Hall of Fame. Anyway, his tequila story goes like this- Sammy was fishing in Cabo San Lucas where he had his first taste of premium white tequila. Immediately a convert, in 1996, he formed the Cabo Wabo Company. Cabo Wabo is now available in four varieties: Blanco (white), reposado, anejo (aged) and Uno which is the extra special signed & numbered edition. Puff Daddy endorses the Diageo produced Ciroc Vodka. While I’m not exactly sure what the terms are of his involvement with the brand, whether he’s invested in it, or his role is purely one of endorsement. I have seen him appear in their television and print advertising, beyond that, I’m not sure how vested he is in Ciroc. We all know that Diageo produces everything from Guinness to Tanqueray to Bailey’s and everything in-between. Sauce (another member of Van Halen). Marky Ramone’s Pasta Sauce- We are all familiar with the Ramones and I was fortunate enough to see them perform several times. Three of the Ramones are no longer with us, but their Gabba Gabba Hey contribution is forever solidified in the industry. The guys came in during a post punk period of the New York music scene and served up the most basic music with pretty much equally simple and ridiculous lyrics. Love them or hate them, but you have to respect them. Marky Ramone, the known conservative member of the group apparently is a food enthusiast! Hailing from Brooklyn, NY, Marky’s grandfather was a chef at New York’s legendary 21 Club. Marky now bottles and sells his grandfather’s secret recipe, which is appropriately called “Marky Ramone’s Pasta Sauce”. The price of a bottle of Ramone’s secret sauce doesn’t come cheap $88 for 12 jars available on markyramone.com. I have to admit, I’m curious to try it! On his website, Marky claims that the true secret to the sauce is the music he listens to while he cooks which run the range of The Rolling Stones to Frank Sinatra. I suppose shaving your garlic into super paper-thin slices is a more inspiring task when listening to Frank, I however prefer Louis Prima. Okay, maybe he’s not a musician, but who doesn’t love the movie Ghost Busters? Were you aware that Dan Aykroyd had a vodka company? Were you aware that the packaging is totally cool and looks amazing in a bar? 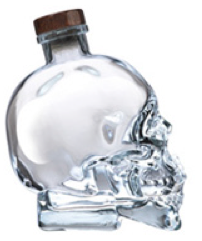 Crystal Head Vodka contains deep glacial aquifer Newfoundland water (supposedly) that is distilled four times, contained in a glass skull designed by American designer John Alexander & inspired by the legendary 13 Crystal Heads that have been found throughout the globe (see Indiana Jones & The Legend of the Crystal Skull). The vodka itself has a great, smooth vanilla infused flavor. Definitely give this one a try or order one for your bar. I guarantee instant bar style upon purchase and display. Have you tried some sort of musician endorsed food or drink item? Honestly, I can say that some celebrity endorsement rarely encourages me to purchase anything. I have seen the Dan Aykroyd Vodka at local bars and was immediately drawn in by the skull bottle- I was shocked when the bartender told me that Dan Aykroyd makes it! If I purchase it, it will be because it actually does taste great and will look fantastic in my bar. If any of these items deliver good taste, then they are truly worth the purchase. Otherwise, it just might be another attempt to bring in extra bucks from a $10 hot sauce. Hey, did you hear it snowed? Uhm, did you hear that it’s supposed to snow again? It’s snowing NOW actually! So yeah, the weather in New York has been absolutely dreadful this winter. We’ve actually run out of places to put the snow. There are massive piles so high, I’m certain they will be here until June. Mentally, I’ve gone through the stages: Denial- “this can’t be happening”, Anger- “WHY is this happening? (shakes fist), Bargaining- “please don’t snow on Tuesday for that event I have to go to” AND in my case, right back to denial. Currently at the denial stage (again) and so, I’ve decided from now until May, I’m going to close my eyes and pretend I’m on a tropical island until it all goes away. With this I’ve decided to dine on tropical inspired food and sip tropical cocktails. With this idea firmly in place, as the last blizzard was just starting, I decided to go to the fish market and pick up some shrimp and some cod. The shrimp became a lovely coconut crusted dish that I paired with my favorite spicy coleslaw and the cod became fish tacos, which I’ll get into with my next post. The below recipes really did transport me; I put on some Don Ho, busted out the Tiki glasses and cranked up the heat. It was kind of like paradise…only with white out conditions outside my window as opposed to crashing white crested waves. Maybe by March I’ll have moved into the acceptance phase. Make the batter first & when done put it in the fridge. In my experience cold batter adheres better & will also allow the coconut to adhere better. Leave it in the fridge while you clean your shrimp! Mix together flour, cornstarch, salt and white pepper. Add 2 tablespoons of vegetable oil and the ice water. Stir to blend. Store in fridge until ready. Peel, devein and wash shrimp. Dry well on paper towels. Pour the coconut into a shallow pan. Dip the shrimp one at a time into the batter, then roll and press the shrimp in the coconut. Once coated, place each shrimp into a frying pan of oil heated to 350 degrees. Fry the shrimp in the hot oil until lightly browned; about 4 minutes. Make the dipping sauce: combine marmalade, mustard, honey and hot sauce in a small bowl. Mix well. Mix all of the above and refrigerate. I like to make the slaw first and give the flavors a chance to meld a bit for better flavor. 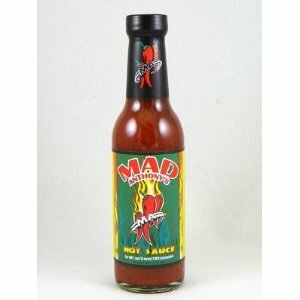 This is also great served over burgers and can be prepared up to a day in advance. Blend rum, coconut milk and pineapple, with 2 cups of crushed ice, on high for a few seconds, until all large chunks of ice are gone. Pour into glass. Top with whipped cream and a cherry.